Is your business thinking about offering free Wi-Fi to your customers (or even to anyone who’s passing by)? It might seem like a thankless and exhausting offering, but the reality is you’ll be getting something out of it. Some people say that anything free isn’t valued, but that isn’t necessarily true. It might be just what your business needs to not just attract more (paying) customers, but also seriously give your reputation a boost. But I thought it would be fun to step out of fantasy land for a second and consider the top 10 gadgets that I actually use on a daily and/or weekly basis. Maybe this will give you a glimpse into the inner depths of my life…or maybe not. What can I say. I’ve got a RAZR, but that’s mostly for fun. When it comes to the daily grind, I still find myself preferring the simple, big-buttoned, hard to lose, big bodied Nokia from three years ago to the sleek, thin pretty flip-phones of today. Maybe that makes me uncool. But in this post, I’m all about telling it as it is. 4 hours a day with this baby. Sure, I can’t play Pirates or Empire Earth 2 on it, but I spend at least six hours a day on this sucker. Type, type, typing away. It does plays Empire Earth 1 though! And it does some mean web browsing, email checking and word processing. Hey, I use it and that’s all that matters in this post. Well, it isn’t really old-old. But it isn’t the new Lite either. Big and bulky, I play Mario Kart or Advanced Wars every night as a bedtime story. Eight cups a day for three years and still chugging. Simple yet effective. I just wish they’d make it fool proof for those times when I forget to slide the pot under the filter and the coffee runs all over the counter. Sure, I’d love the electric Tesla or a hybrid or a Ford Mustang, but for $17,000 I just bought a brand new Hyundai Tucson that’s actually fun to drive and has plenty of room for hauling. I just wish I could find some places on the East Coast to do some mild off-roading. Every time I get in this sucker I want to drive up on the curbs. He’s getting old, but when I’m on the road, my Dell Axim gives me the flexibility I need to track down free WiFi…and that’s all that matters, right? It’s like a treasure hunt, and once I’ve found free WiFi, my heart skips a couple beats before I fetch the laptop and hunker down for an internet feast. Want to figure out how old I am? Figure out which year the TI-81 first came out, then figure that I was in 8th grade at the time. You know what. This calculator has balls of endurance. It graphs, it charts, it makes entering calculations a breeze (you can screw up and edit your numbers without having to type everything else in again). Hey, I’m still using it almost everyday, 15 years later with the original batteries (kudos to Duracell too). Now that my wife and I do Blockbuster through the mail, we have a steady stream of DVDs flying to our house each week. The DVD player which was sort of bought for “emergency” cases of boredom, has turned into a nightly event. Ali G, Curb Your Enthusiasm, and all the movies you can shake your fist at (though many of them turn out to be duds, like last nights movie…which I hated…Flightplan). Dell has really jumped the gun this time by announcing the incusion of Broadcom 802.11n cards in its XPS and Inspiron line of laptops. 802.11 is WiFi, right? And WiFi should be standard on all laptops, you say? Well, this particular WiFi flavor has an extension, which is the letter “n”. And it’s not really good to consider this standard for now, since the governing body that standardizes WiFi technologies, the IEEE, has not yet approved the “N” standard. Like many consumers, Dell is getting a little sick of waiting around for the IEEE’s Task Group N to pull it together and roll out a final version of the next-gen WiFi standard, so the company has decided to start offering its own draft-802.11n card in all XPS and select Inspiron laptops. As you’re probably already aware, 802.11n will be a wireless networking protocol that uses MIMO technology to offer greater range and speed than traditional 802.11a/b/g networks, but has been famously bogged down by delays and questions of interoperability. What’s with WiFi N anyway? Why are people getting so excited and skeptical at the same time? Remember the difference between WiFi B and G? Aside from the marginal range increase of WiFi G over B, there’s the speed increase. G can run on 54 Mbps, while B maxes out at 11 Mbps. Guess how fast WiFi N is supposed to go–it maxes out at 270 Mbps (or even supposedly 300 Mbps), and has a range twice the distance of WiFi B ranges. That’s surely a big increase and people with networks that have nodes spaced far apart or in between thick walls are sure to benefit from the range increase. However, the issue is that the IEEE has not yet approved the spec, so device manufacturers have to do with the “draft” spec for now. And when the time comes that the spec is already approved, the “draft” devices might not work perfectly in conjunction with those that use the final spec, unless firmware updates are installed. So is it all right to buy those Dell computers? Probably so, because the company promises backward-compatibility with B and G WiFi networks. However, remember that increased speeds and range would only work in conjunction with N-draft-spec routers that support the Intensi-Fi implementation of WiFi N (notably the Netgear WNR834B). Also, remember that your Internet connection would still be limited by the actual speed of your broadband connection (DSL, cable, etc.). This would definitely be below 270 Mbps, or even below the usual 11 Mbps offered by WiFi B. So any speed increase would only be noticeable when transferring files within the network. We think they’re jumping the gun a bit, but Newsweek is running a story on how Nintendo is primed for a comeback with the Wii. Their main argument of course boils down to the e3 response coupled with an attractive price point. Oh, and while we’re on the subject of video games, there is more evidence that gaming is good for children. Told you so mom! Hey, good news for all you WiFi anywhere freaks. M2Z Networks, fronted by former FCC official John Muleta, is looking to provide free WiFi across the USA. Ad supported of course. Now the fun will be seeing who can win the race and roll out free WiFi first. My bet is on Google…. Speaking of WiFi, looks like the geeks at IEEE can’t make their minds up about Wireless N standards. Sure, we’ve got the N draft models coming out already from Linksys, et al. But true Mimo Meshing will need to wait a while. So, can’t make up your mind between Mac, Linux and MSoft? Why not buy a MacBook and use all three. While you’re at the software modifications game, why not try your hand at some DS Lite Brew. MmmmmMmmmmGooood! Update: TechCrunch has an informative write-up on our current options for downloading TV shows off the internet. Neil Kjeldsen covers the current offerings from the major networks, the major platforms (iTunes, etc.) and the possible contenders. He also offers some speculation on how overlooked shows might benefit from internet distribution. Nokia is releasing an OS2006 upgrade for its 770 Tablets that will include a Linux distribution as well as Google Talk for added communication capacities. The upgrade is the realization of a partnership between Google and Nokia that is expected to boost sales of Nokia’s line of Internet devices. According to Nokia, one of the most requested features from consumers was VoIP capabilities. They’ve added VoIP in the latest upgrade along with a whole host of other features that are all about one thing: streamlined mobility. Nokia is betting on the fact that internet use will become fully mobile just like phone use has. We sure hope so! You can begin to see a glimpse of Google’s overall strategy in this relationship from comments that some of its employees have made. In particular, Google has made clear on numerous occasions that company growth is going to be correlated to growth in web usage and information retrieval. One obvious way to grow web usage is to get people to use the net even when they aren’t at home. We put services out that we think users want to see. Then we watch how they use it. Our mission is to organize the information of the world and make it accessible. The 770 plays into the ‘accessibility’ part of the mission. Because Nokia has made it even easier to access Google search, users will be able to get the information they need, when they need it, and regardless of where they are. It looks like Google’s strategy going forward is all about getting more eyeballs, more of the time, clicking on more advertisements, so that they get more money. That’s business, folks. Linksys Wireless-G VoIP WiFi Phones – I Want One! Linksys has released two VoIP phones for use over WiFi connections. Both phones allow users to choose which VoIP carrier they use (e.g. Vonage, BroadVoice, etc.). 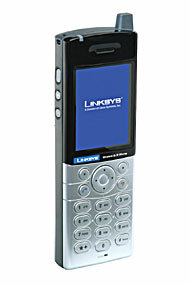 One of the interesting things about these Linksys’ VoIP phone offerings is the fact that they have packaged many of the features one normally finds in a cell phone, such as a phone book, customizable ringtones and wallpaper. 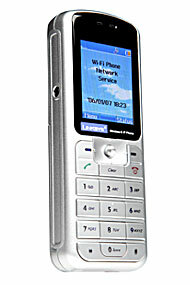 The entry-level phone is model WIP300 which features a 1.8-inch color LCD display and has a retail price of $219.99. The WIP300 opeartes in the 2.4Ghz band and is 802.11b/g compatibile. Some of its features include caller ID, call forwarding, call transfer, SIP v2 support, WiFi survey tool, backlit keypad, signal strength and battery level indication, and a USB charger interface. It also allows you to customize your phone by selecting from a large variety of ringtones and different wallpaper images. One of the downsides of the WIP300 is the fact that it isn’t prepared to work at hotspots that require credentials. The higher-end phone model WIP330 is thinner and sleeker than its entry-level cousin yet features a larger 2.2-inch color LCD display. It retails at $369.99. In addition to the features in WIP300, the WIP330 adds a web browser, Quality of Service support, and access to hotspots (so you can literally connect anywhere you can find a hotspot connection). You can also do 3-way conferencing and use call hold and resume. The browser support allows for users to connect to the web to check email or even watch video. Voice over IP has clearly emerged as the future of telephone communication and Linksys is leading the way. With the launch of our family of WiFi phones, we can take the technology to a whole new level. Looks like Linksys has two nice products on their hands here, and so far as the WIP 330 is concerned, I Want One (Badly!). Linux Devices reports that the first wireless 802.11n draft-compliant systems run Linux. This is good news for those who follow the 3rd Party firmware industry and employ one of the many feature rich solutions from companies like Sveasoft, DD-WRT, etc. In fact, the first commercial Draft N product off the shelves from Linksys, the WRT300N seems to use a lot of open source code, which is easily available to be modified (hacked) and added enhanced. Unless Linksys pulls another WRT54G v5 bomb, draft N looks like it will be amenable to such amenities as doubling as a webserver, VPN server, operate in client mode, use WDS etc.